According to general relativity, a clock moves in such a way as to spend not a minimum, but a maximum of its own time on the traversed path. We have found out the physical meaning of the wave equation and now we can use it to solve some problem, for example, the movement of the body in the gravity field. So, in the gravitational field from the point A to the point B the clock moves. What can we say about this, using the wave equation? The clock, like any material object, has wave properties, it moves so as to spend a minimum of its own oscillations on the path traveled. Based on the principle of equivalence, we can conclude that gravity affects all processes equally. Therefore, the speed of the clock during its movement varies proportionally to the frequency of its internal quantum oscillations. The clock moves so that the difference in its readings is minimal. So far, everything is clear. 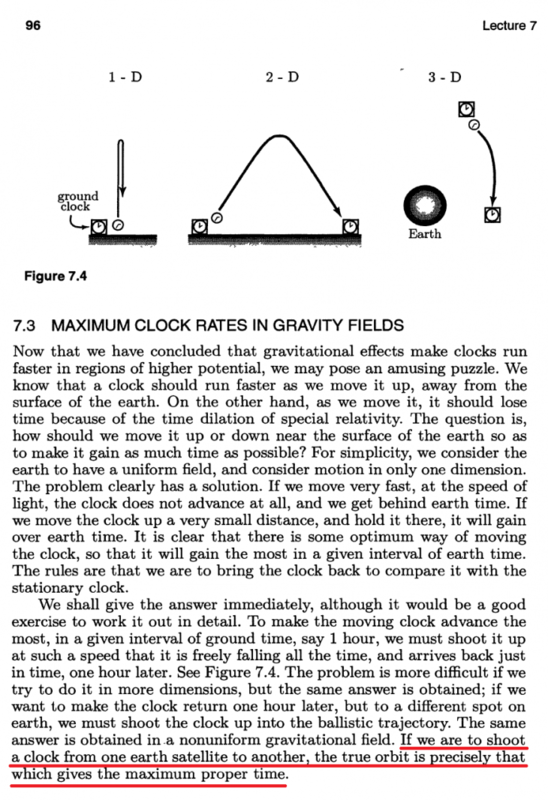 The problem of movement of a clock in a gravitational field is well known and has already been solved in the general theory of relativity. See the solution on the figure above (it is a quote from Feynman lectures on gravitation). So, according to GTR, the clock moves in such a way as to spend not a minimum, but a maximum of proper time on the path traveled. This is impossible! Even Richard Feynman did not see here the contradiction between the general relativity and Fermat’s principle, which is the base of quantum physics. After all, according to Fermat’s principle, any object must always move (even in a gravitational field) so as to spend the MINIMUM of its own time on the path traveled. So, according to GTR, the clock moves in such a way as to spend not a minimum, but a maximum of own time on the path traveled. This is impossible! Even Richard Feynman did not see here the contradiction between the general relativity and Fermat’s principle, which is the base of quantum physics.